The men’s basketball team began their 2018-2019 season on Wednesday, Nov. 14, with a 74-43 home loss to the University of New Haven in a non-conference game. Seven players were eligible to play that day. 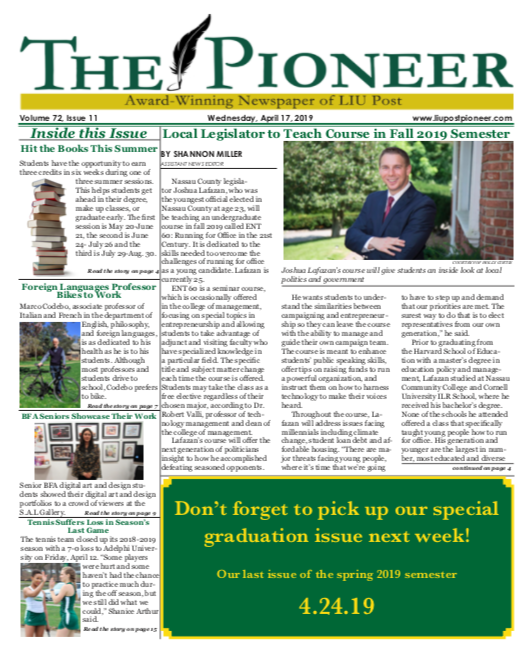 With the news of the upcoming merger between LIU Post and Brooklyn’s athletic departments, a large majority of the men’s basketball team decided to transfer, leaving the Pioneers in search of extra players. Of the seven remaining, Alonzo Ortiz-Traylor, sophomore forward, is the only person to have played for the Pioneers last season. He led the way with 22 points and 10 rebounds and played all 40 minutes of the contest. Alongside Ortiz-Traylor, Jackson Jordan, sophomore, played the whole game as well, contributing 6 points and 10 rebounds. He also achieved a one-handed jam in transition in the first several minutes of the game. New Haven outscored the Pioneers by 48-17 in the first half of the matchup. The Pioneers shot 24 percent from the field during the first half, while 0-14 from behind the arc. They finished the game at 29 percent from the field, and 3-28 from behind the arc. The New Haven Chargers were led by Quashawn Lane. In 26 minutes, the freshman point guard scored 8 points on 4 of 5 shooting, while grabbing 8 rebounds, and dishing out 7 assists. Najee Larcher, senior forward, added 8 points and 10 rebounds in 22 minutes. The Pioneers have four more non-conference games left on their schedule before the East Coast Conference opener against Molloy College on Dec. 5. The upcoming three games will take place in the Pratt Recreation Center. On Dec. 1, the Pioneers will travel to Nyack College.